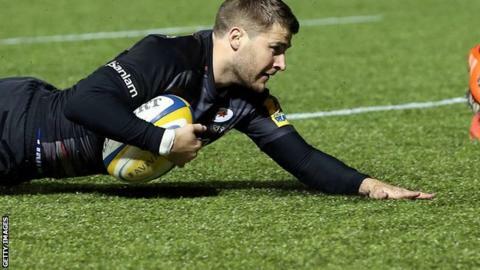 Richard Wigglesworth scored a second-half hat-trick as Saracens thrashed the Premiership's bottom side London Welsh. Sarries secured the bonus point before the break with two Mako Vunipola tries and others from Brett Sharman, George Kruis and Chris Ashton giving them a 38-7 advantage. Elliot Kear's converted try was Welsh's only response as the hosts ran riot. Jackson Wray, Richard Barrington, Ben Ransom and Wigglesworth's treble helped lift Sarries to fourth in the table. The Exiles have conceded more than 50 points in five of their 10 games so far this season, with the defeat by Saracens their heaviest to date. They lost 71-7 to Wasps just over a month ago. Their early season struggles are in stark contrast to their only other season in the Premiership in 2012-13, when they managed to win four of their opening 10 matches. The victory was the first in four league games for Saracens, dating back to a 28-21 win over Gloucester more than two months ago. England prop Vunipola, making his first Premiership start of the season, scored the first try inside three minutes and he crossed again after Owen Farrell added a penalty. Sharman and Kruis also went over before Ashton burst away for the fifth before Welsh finally produced some attacking impetus, with Peter Browne putting Kear through. Will Robinson added the extras, but Saracens responded with Wray going over from a driving maul and Welsh's task became even tougher following Browne's sin-binning. Barrington and Wigglesworth came off the bench and added to the try count, and Ransom showed scintillating speed to grab one of his own to crown a dominant display. Farrell missed just one conversion as he finished the match with a personal tally of 23 points. Saracens: Ransom; Ashton, Bosch, Taylor, Wyles; Farrell, de Kock; M Vunipola, Sharman, Johnston, Kruis, Hamilton, Wray, Brown, Joubert (capt). Replacements: George, Barrington, du Plessis, Botha, B Vunipola, Wigglesworth, Hodgson, Tompkins. London Welsh: Robinson; Stegmann, Reynolds, Barkley, Kear; Weepu, Lewis; Reeves, Britton, Vea, Browne, Down, McCaffrey, Kirwan (capt), Fonua. Replacements: Morris, Trevett, Cooper, Schofield, Pienaar, Rowley, May, Scott. Sin Bin: P. Browne (50), McCaffrey (80).